Dr. Taihei Ninomiya has won the poster award at the 2015 Annual Meeting of the Korean Society for Brain and Neural Sciences in Daegu, Korea. 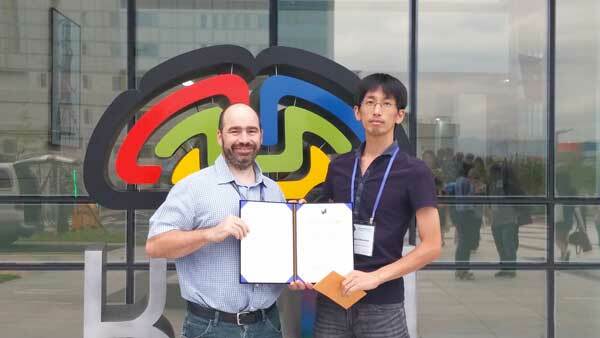 Dr. Ninomiya received the ‘best poster award’ for his presentation of ‘Prominent alpha-gamma phase-amplitude coupling underlies motor-tic encoding in cerebro-basal ganglia-cerebella networks’. The award recognizes the scientific advances that Dr. Ninomiya has made using nonhuman primates to reveal the strong synchronization that occurs across the primary motor cortex, the basal ganglia, and the cerebellum during motor tics. This work was undertaken as part of a research project run by Dr. Kevin W. McCairn of the Korea Brain Research Institute, in collaboration with Prof. Masahiko Takada of the Primate Research Institute, and supported by the Tourette Syndrome Association - USA.